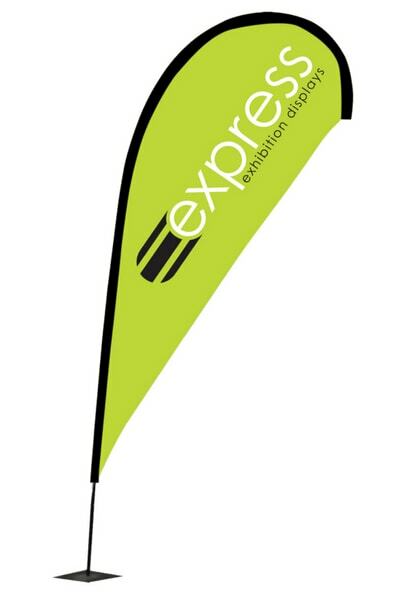 This outdoor advertising flag is perfect to draw attention to your stand, or promotion for any outdoor display. Printed single-sided. Call us for double-sided options. Two delivery options available, Express 3 day delivery and Standard 7-10 day delivery. As our mid-sized flag, it is perfect for all outdoor purposes and stands at over 2.5 metres tall – great for getting your brand noticed from afar! Bases are sold separately and help to steady your display. Choose our free artworking service for a logo placement and colour selection option at no extra cost. We can position your logo wherever you like on the flag and closely match pantone colour references that you provide. Simply upload your logo using our artwork uploader and we’ll get in touch to get all the details from you.